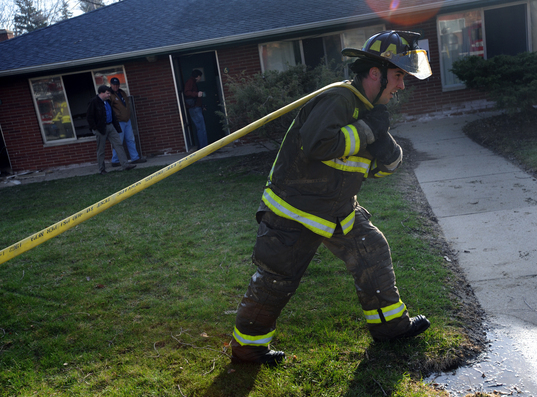 Ann Arbor Firefighter Jim Tiernan starts cleaning up the scene after helping put out an apartment fire on Arbordale Street in Ann Arbor Wednesday morning. Ann Arbor firefighters extinguished a kitchen fire in an apartment on Arbordale Drive near Pauline Boulevard on the city's west side this morning. Firefighters responded to a report of a fire in the 1000 block of Arbordale Drive at 7:58 a.m., a Fire Department press release said. Heavy smoke was pouring from the apartment's front door and eaves when firefighters arrived. They extinguished the blaze by 8:23 a.m., but it caused smoke damage throughout the apartment, the release said. No one was injured. The cause has not been determined, the release said.